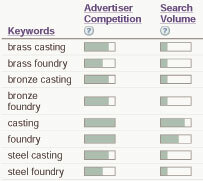 The keyword analysis tool generates potential keywords for your ad campaign. The tool includes keyword generation, popularity, keyword trends and seasonality, cost and ad position estimates. Site-related is advised in that it allows you to see your site the same way the search engines do. Enter the most you are willing to pay per click. Google insures that highest placement possible for the least cost. If you are willing to pay $0.10 per click and the next highest competitor is $0.05, you will appear first for $0.06. I advise paying as little as possible to insure maximum exposure. The highest paying clicks ad budget will be consumed first, leaving you with the most exposure for the least cost. The estimate ad position column indicated where your ad will appear in the sponsored links section. The higher the better. A number of 8 or less insures first search page location. Key words should be specific. Casting alone will generate a lot of traffic, but not necessarily to your site. Is the searcher looking for entertainment casting, medical casting (as in broken bones) or materials casting (your product). The higher the search competition, the greater the cost. Search word trends is useful in both showing the trends of specific key words as well as comparisons of one keyword to another. Both worldwide and national trends can be examined. 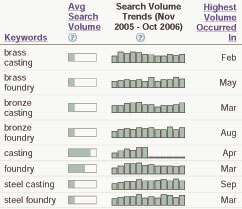 The actual keyword volume is not given, and a specific amount of traffic is required for any key word to appear. 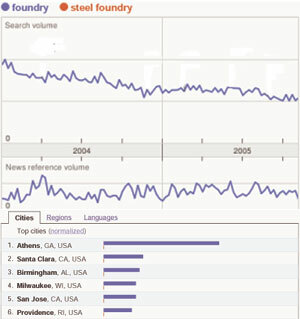 (Relative) activity by city, region (country) and language can also be shown. Your ad should be simple and enticing. Describe unique features of your product and what separates you from your competition. Your ad must be a call to action. Some phrases are Buy, Sell, Order, and Get a Quote. You are now ready to begin your Google AdWords campaign. Google offers a wide variety of AdWords on-line support guide and demos and an on-line learning center for in depth training. Google AdWords tips section offers a roadmap for success for your ad campaign.